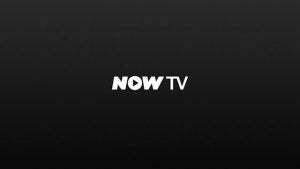 The Now TV app is free to download and is currently available on Android and iOS but not Windows Phone. 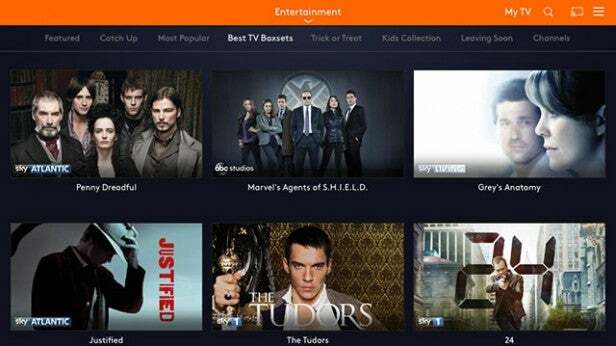 As the name suggests, the app utilises the Now TV streaming service, provided by Sky, to bring you a selection of movies, TV shows or sports channels. To use the app you will have to purchase one of Now TVs passes which are separated into three different packages. The Movie Pass costs £9.99 per month and promises access to the latest movies on offer as well as plenty of older flicks. Buying the Entertainment Pass will set you back £6.99 per month and gives you a selection of TV shows currently airing across a multitude of channels, including Sky Atlantic, Sky 1, FOX and HBO. The Sports Pass is a little more pricey at £6.99 per day or £10.99 for a week. For this you will get access to all of the Sky Sports channels as they are aired. By purchasing one of the packages you can view it via the Now TV app on up to four devices. Now TV seems to offer quite a lot but when you look at the current pricing you can quickly see it has the potential to make your viewing habits become quite expensive. Compare it to the likes of Netflix, who give you movies and TV shows for just £6.99 a month, it does seem a little pricey. However, because Now TV is powered by Sky, you do get a few of the latest movies before you can on other services and TV shows tend to appear fairly soon after they’ve aired in the US. The app itself is very easy to use with a clean and attractive interface, but right from the start you hit a rather annoying hurdle. You can’t sign up from within the app, and you can’t even have a look around without an account. In fact, you can’t manage anything account related from within the app. You can see a few basic account details, your current subscription and expiration date, but you can’t change or add any personal details or even renew your current subscription package. Desiring to do any of the above, including signing up to the service, will result in you having to visit the Now TV website. Some of you might find the lack of account access useful if you let your kids use your tablet or phone a lot, but we’re sure most people would prefer to use the streaming service and manage their accounts all under one roof. Once you’ve got the activation out of the way and you’re finally signed into the app you get a visually pleasing selection of the media currently on offer. You can switch between movies, TV and sport from a simple drop down menu at the very top of the app, while a set of preset menus live underneath giving you the option to filter the recommended movies and shows. Tapping the menu icon will reveal further filtering options, this time by genre. See also: Best music streaming service – Which one to download? Unfortunately, there is no A to Z directory within the app so there’s no way of browsing Now TV’s entire catalogue. If you know what you’re looking for then the search function is your best option. Watching a film or TV episode is child’s play. Find what you want, tap the play button and away you go. If you decide you need to do something else and close the app it will keep track of where you left off the next time you load the same film or episode. Anything you do watch gets saved to the My TV menu so you can keep track of the episodes and movies you’ve watched. While this is handy, it’s only available from the main screen and can quickly get disorganised if you watch lots of different TV shows. It would be far easier to have an icon next to watched content so you can quickly see where you’re up to in a box set. We would also like to see the addition of an editable favourites list so we can quickly jump into shows we love. For those of you who like to use your device as a remote and fling the content on to a bigger screen, you’ll be pleased to know the app supports, and works very well, with Google’s Chromecast. It doesn’t, however, support AirPlay to the Apple TV. This is probably because the app is available natively on the Apple TV so while the lack of AirPlay is no big deal, it would’ve been nice to have the option baked into the iOS app. A native version of the app is also available through other devices like the Roku, the PS3 and PS4, both the Xbox One and Xbox 360 as well as YouView and the LG Smart TV. In addition, the service is available to watch via your computer’s Internet browser, should you feel the urge. Picture quality on a broadband connection was good but, even if you have a super-fast fibre optic connection, Android and iOS users will only receive standard definition. If you use the service via a Now TV Box, Playstation, xBox, Roku, LG TV, Chromecast or AppleTV you can view the content in all its 720p glory, providing your connection speed is up to it. 1080p isn’t available over the streaming service at all – this is reserved for Sky’s more premium services. In reality, watching TV on an iPad in SD over a 10mb connection wasn’t bad at all and content never stuttered or took a break to buffer once it had started to play. On occasion the content did take a short while to start and the first few seconds of play were extremely pixelated, but this could be down to any number of factors and it would be unfair to shove the blame towards Now TV. We’ll save the finger pointing for the lack of HD streaming. While we mostly tested The Now TV app on the 10mb broadband connection we were also pleased to see the same quick interface load times using a 3G connection. Obviously, the actual video content took ages to load on a 3G connection and wasn’t great quality, but we can’t imagine too many people will be using Now TV in this way as it will eat up your data very fast. The one really big attraction to Now TV is the offer to access new shows and movies before the other competing streaming services. 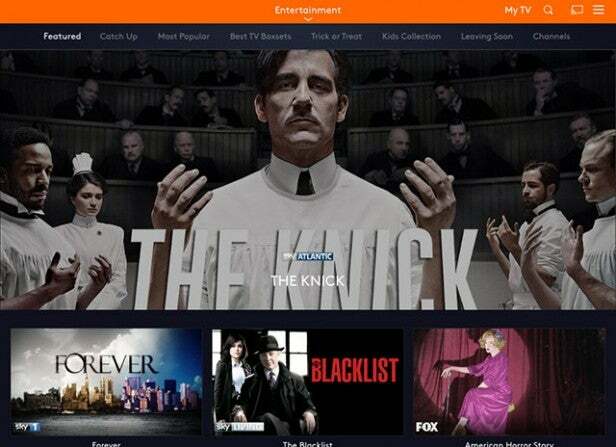 However, the availability of content on Now TV is constantly changing, hinging on certain licensing deals between the studio networks and Now TV. Finding a series you really want to watch only to find it’s missing the first episode or two isn’t that uncommon. This is because you have 29 days to watch a show from the time it is made available. If you join Now TV part way through a new season of your favourite show you will likely discover the first few episodes are missing. It is probably more prudent to wait until Now TV decide to put the entire season back online as a complete box set but by doing so you will have a longer wait. Armed with this knowledge, it isn’t too surprising to discover entire shows, such as Game of Thrones, are currently missing. The HBO hit is broadcast on Sky Atlantic, a channel that is offered through Now TV, yet the Westoros dwellers are nowhere to be seen. It’s likely when season five is underway next year you’ll get the standard 29 days to watch each episode but if you want to watch the entire box set starting from season one… well, right now this isn’t possible. Our own advise is to research what shows and movies are available before deciding whether to buy a months pass. Whilst browsing the TV section within the app, we were very happy to see new episodes of The Walking Dead appearing just days after they were aired in the US, but this quick availability doesn’t seem to apply to every show. The Blacklist season two, for example, is currently six episodes in yet Now TV only offers the first three episodes at the time of writing. 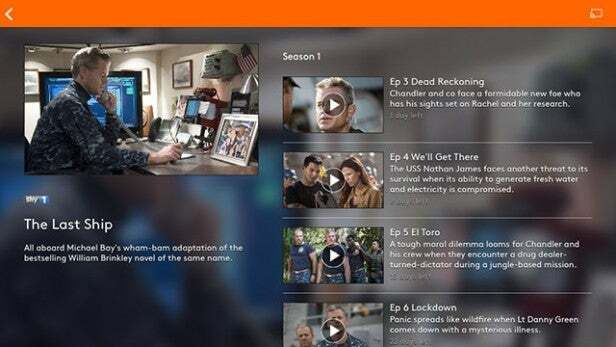 This can be very frustrating for fans of the show eagerly awaiting their next viewing fix. There are plenty of shows available to watch, though, including The Knick, Da Vinci’s Demons, NCIS: Los Angeles, Justified, Marvel’s Agents of S.H.I.E.L.D., The Flash, Greys Anatomy, Arrow and Penny Dreadful, to name but a selection. Checking out the Sky Sports package revealed a much more straight forward approach to viewing content. For your money you basically get all of the Sky Sports channels (Sky Sports 1 through 5, Sky News HQ and Sky Sports F1) as they are broadcast. There isn’t a catchup service available so if you want to watch that big game, you better make sure you know what time it’s on before paying £6.99 and committing to a single days access. On the movie side of things there are lots of titles to watch, old and new. None of them are hot off the cinema screen but the variety is good and there is plenty to keep the kids entertained. Popular titles include Gravity, Jack Ryan: Shadow Recruit, all the Toy Story films, World War Z, American Hustle, Iron Man, Anchor Man 2, Cars and Despicable Me, but remember the availability of titles is constantly changing. Thanks to the lack of an A to Z directory there is only one way, that we could find, to see what is currently available on Now TV before committing to a monthly pass, and that was via the Now TV forum. Thankfully, the site provides a list of all the Now TV Boxsets and you can see what movies are currently showing from the Top 100 UK box office, from the last 18 months in the list of the Now TV movies. 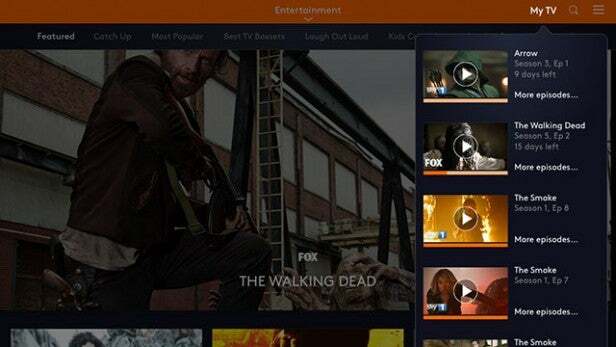 The Now TV app has the potential to be really great. 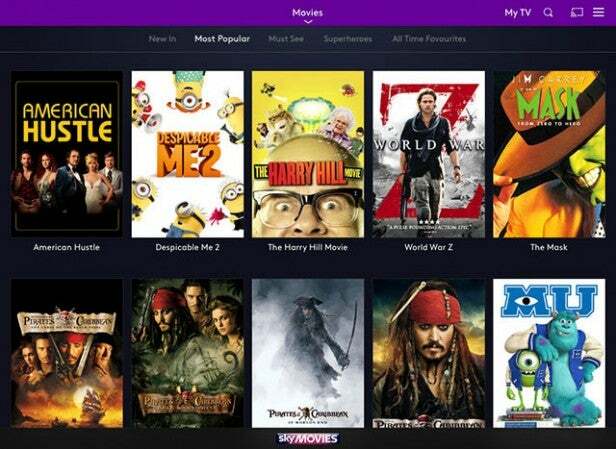 The interface is easy to use, it loads nice and prompt and offers a great selection of current movies, TV and live sports. The back catalogues aren’t too bad but certainly lack the variety of competitor services, like Netflix or Amazon’s LoveFilm. Some fairly major TV titles are currently missing and, rather annoyingly, some of the available box sets are missing single episodes. Where the service really gains ground is with the availability of brand new TV episodes shortly after they’ve aired and new(ish) movie titles are available before most other avenues thanks to Sky’s Box Office service. If you don’t have any TV subscription services on the go, Now TV is a good option to consider as you can opt in for a month with no contract and watch a box set or several movies. But bear in mind you can also do this with other services like Netflix, who are cheaper and offer content for longer periods of time. With a few interface tweaks the app could flourish but first, Now TV really needs to iron out its licensing agreements in order to offer a much wider variety of content for longer durations. The post Now TV app appeared first on Trusted Reviews.